So what are you doing for Labor Day weekend? It's supposed to be over 100 degrees here, so we are thinking about a day trip to San Francisco, where I'll need to wear a sweater to stay warm. Darcy is definitely overdue for her first trip to The City, don't you think? Our Little Life features a Rachael Ray recipe that is perfect for using up leftover hot dogs - Hot Dog Casserole. Seriously! Jessica at Aspiring Gourmet tried Rachael's recipe for Charred Tomato Soup and Stromboli. Cate at Sweetnicks gave Rachael's recipe for French Bread Pizza a try. Man, now I have to make it again. Allena at Star Knits tested Rachael's Roasted Caprese Spaghetti and had great results. Shelly at Nibbles of Tidbits didn't like the results of Rachael's recipe for Fra Diavolo Potato Salad. Linda at Tender Crumb adapted Rachael's Red Velvet Cookies to put together ice cream sandwiches. Jacob at Food Network Addict updates us on how Anthony Bourdain feels about Rachael Ray lately. 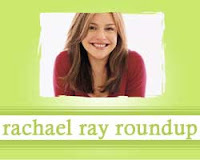 Why does Anthony B think it is alright to trash Rachael Ray?? I don't hear RR trashing him or anyone else for that matter- AB is a classless no talented jerk !! Andie - I hope you and your family ended up safe and sound! Anony - I love Anthony Bourdain. He cracks me up. Thanks for linking to my blog - yours is a great read!